Wikimedia Commons has media related to 20th-century actresses from the United States. Pages in category "20th-century American actresses"
The following 200 pages are in this category, out of approximately 6,268 total. This list may not reflect recent changes (learn more). Acquanetta, nicknamed The Venezuelan Volcano, was a B-movie actress known for her exotic beauty. The facts of Acquanettas origins are not known with certainty, although accounts differ, Acquanetta claimed she was born Burnu Acquanetta, meaning “Burning Fire/Deep Water”, in Ozone, Wyoming. Other accounts suggest her ethnicity was African American, her career was followed closely by the African American press, Acquanetta started her career as a model in New York City with Harry Conover and John Robert Powers. In 1950, Acquanetta married painter and illustrator Henry Clive and returned to acting and she retired from movies and became a disk jockey for radio station KPOL in Los Angeles, CA in 1953. The couple were prominent citizens, donating to the Phoenix Symphony and she and Ross had four children, and divorced in the 1980s. In 1987, Acquanetta sold the Mesa Grande ruins to the city of Mesa, Acquanetta wrote a book of poetry, The Audible Silence, illustrated by Emilie Touraine, Northland Press,1974. Aaliyah Dana Haughton was an American singer, dancer and model. She was born in Brooklyn, New York, and raised in Detroit, at the age of 10, she appeared on the television show Star Search and performed in concert alongside Gladys Knight. At age 12, Aaliyah signed with Jive Records and her uncle Barry Hankersons Blackground Records, Hankerson introduced her to R. Kelly, who became her mentor, as well as lead songwriter and producer of her debut album, Age Aint Nothing but a Number. The album sold three million copies in the United States and was certified platinum by the Recording Industry Association of America. After facing allegations of a marriage with R. Kelly, Aaliyah ended her contract with Jive. Aaliyah worked with record producers Timbaland and Missy Elliott for her album, One in a Million. In 2000, Aaliyah appeared in her first film, Romeo Must Die and she contributed to the films soundtrack, which spawned the single Try Again. The song topped the Billboard Hot 100 solely on airplay, making Aaliyah the first artist in Billboard history to achieve this goal, Try Again earned Aaliyah a Grammy Award nomination for Best Female R&B Vocalist. After completing Romeo Must Die, Aaliyah filmed her role in Queen of the Damned and she released her third and final album, Aaliyah, in July 2001. On August 25,2001, Aaliyah and eight others were killed in a crash in the Bahamas after filming the music video for the single Rock the Boat. The pilot, Luis Morales III, was unlicensed at the time of the accident and toxicology tests revealed that he had traces of cocaine, Aaliyahs family filed a wrongful death lawsuit against Blackhawk International Airways, which was settled out of court. 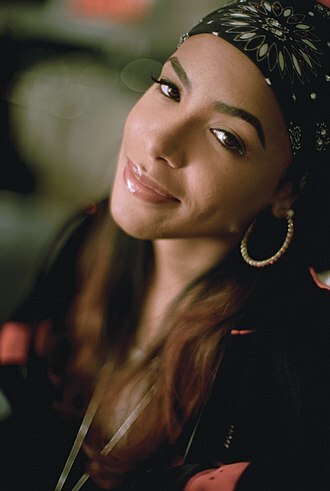 Aaliyahs music has continued to achieve success with several posthumous releases. Aaliyah has sold an estimated 24 to 32 million albums worldwide and she has been credited for helping redefine contemporary R&B, pop and hip hop, earning her the nicknames Princess of R&B and Queen of Urban Pop. She is listed by Billboard as the tenth most successful female R&B artist of the past 25 years, Aaliyah Dana Haughton was born on January 16,1979, in Brooklyn, New York, and was the younger child of Diane and Michael Miguel Haughton. Christina María Aguilera is an American singer, songwriter and television personality. Born in Staten Island, New York and raised in Rochester and Wexford, she appeared on the television series Star Search, after recording Reflection, the theme for Disneys 1998 film Mulan, Aguilera signed with RCA Records. She rose to prominence with her 1999 self-titled debut album spawned the Billboard Hot 100 number one singles, Genie in a Bottle, What a Girl Wants. The following year, Aguilera released two albums, the Spanish-language album Mi Reflejo and the holiday album My Kind of Christmas. She assumed creative control for her studio album, which produced Dirrty, Beautiful. Aguileras fifth studio album, Back to Basics, debuted at one on the album charts of ten countries and spawned the tracks Aint No Other Man. In 2010, Aguilera released her studio album Bionic and starred in the film Burlesque. The following year, she debuted as a coach on the reality television series The Voice. Her seventh studio album, was released in 2012, Aguilera has been featured on several successful collaborations during her career, including Lady Marmalade, Moves like Jagger, and Say Something. Aguilera has been recognized as a pop icon and earned the title Pop Princess in her early years and her work has earned her five Grammy Awards, one Latin Grammy Award, and a star on the Hollywood Walk of Fame. She has sold over 17.9 million albums in the United States as of 2014 and 50 million albums worldwide as of 2015. In 2009, she ranked at number 58 on Rolling Stones list of 100 Greatest Singers of All Time, thereby becoming the youngest and the only artist under 30 to be named. Billboard recognized her as the 20th most successful artist of the 2000s, aside from her work in the entertainment industry, Aguilera is involved in charitable activities through human rights, world issues, and her work as a UN ambassador for the World Food Programme. Christina María Aguilera was born in Staten Island, New York, on December 18,1980, to Shelly Loraine, a musician, and Fausto Xavier Aguilera and her father is Ecuadorian, while her mother has German, Irish and Dutch ancestry. Her family moved frequently because of her fathers service, and lived in places including New Jersey, New York. Osceola Macarthy Adams was an American actress, drama teacher and clothing designer. She was one of the 22 founders of the Delta Sigma Theta sorority, born to a life insurance executive in Albany, Macarthy was mixed with Caucasian, Native American, and African-American heritage. She attended schools in Albany and attended Fisk Universitys Preparatory School, she attended Howard University, where she studied ancient Greek and philosophy. Macarthy was a part of Howard Universitys Class of 1913 and she was a leader in Howards Dramatic Club. Macarthy was a part of organizing Delta Sigma Theta Sorority, Alpha Chapter of Delta Sigma Theta was founded on January 13,1913, at Howard University by twenty-two women. After graduation, she along with fellow founder Marguerite Young Alexander helped to form a chapter in Chicago and she served as national treasurer. Delta Sigma Theta named an award in her honor, for members who contributed to the arts, after graduating from Howard, Osceola married Numa P. G.
Bettye Louise Ackerman was an American actress primarily known for her work on television. She graduated from Columbia College in South Carolina in 1945 and left for New York City soon after and she studied theater at the graduate level at Columbia University and pursued art studies with Joseph Mugnaini and George DeGroat at Otis Art Institute. Ackerman played Dr. Maggie Graham on the ABC medical drama, Ben Casey and she played Anne Frazer on Brackens World and the original Constance MacKenzie on the daytime program Return to Peyton Place. She appeared in an episode of prime time soap Falcon Crest portraying the character of Elisabeth Bradbury. In 1977, she appeared in Never Con a Killer, the pilot for the ABC crime drama The Feather and Father Gang, ackermans Broadway credits include A Meeting by the River. Ackermans film debut came in Face of Fire in 1959, on June 7,1956, Ackerman, at 32, married her future Ben Casey co-star Sam Jaffe, who was 65. Although there was a 33-year difference in their ages, the couple had a very successful and she sold her home in Beverly Hills and returned to South Carolina to be near her large extended family in 1998. Jane Ace on Easy Aces, 1935. Listener postcard from Easy Aces sponsor, Lavoris, about new episodes of the program beginning September 26, 1932. The couple appears to be returning from vacation by freight train. Premiere of "Jane Ace, Disk Jockey", October 27, 1951. Ida Adams and chorus in Houp La! Suzanne Adams Stern, from a 1900 publication.